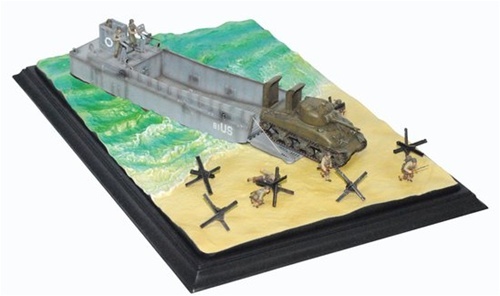 This line features static pre-assembled, pre-painted models made of both diecast and plastic set within a realistic vignette. Each item is fully detailed and historically accurate. In June 1937, the Waffenamt ordered a self-propelled version of the 60cm siege mortar to be built. General Karl Becker of the Artillery was heavily involved in its development, hence the sobriquet "Karl" used to describe it. The driving trials were held at Unterlüss in May 1940, and delivery of six production vehicles occurred between November 1940 and August 1941. In addition to the basic infantry assault craft, the U.S. Army needed a vessel to transport and land its medium battle tank, and in May 1941 Higgins was asked to produce a tank-landing craft. One year later the Navy accepted the 50-foot (15.25-metre) Higgins design, the prototype for the Landing Craft, Mechanized (LCM). During the war, 11,392 LCMs were produced by the United States with 486 used during Operation Overlord.